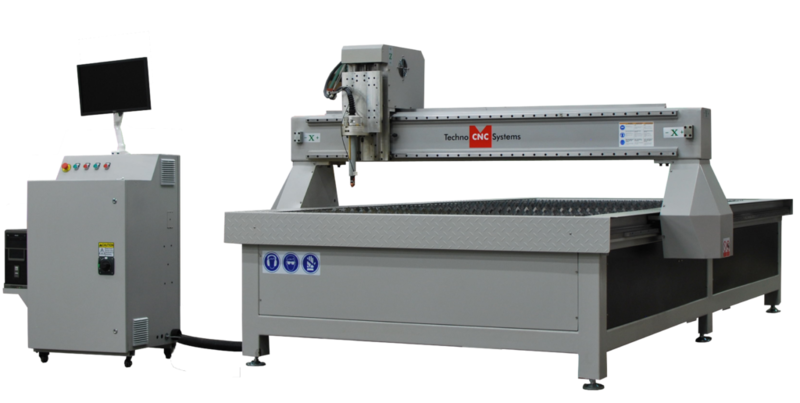 The Titan Series CNC Router is manufactured using the highest quality industrial grade CNC router components with all steel construction with a 7-1/2” gantry clearance and 11-1/2” z-axis stroke so the clearance can be properly utilized. Key features include THK linear guide rails and bearings, precision helical rack and pinion with precision gear motors directly coupled to the helical pinion. 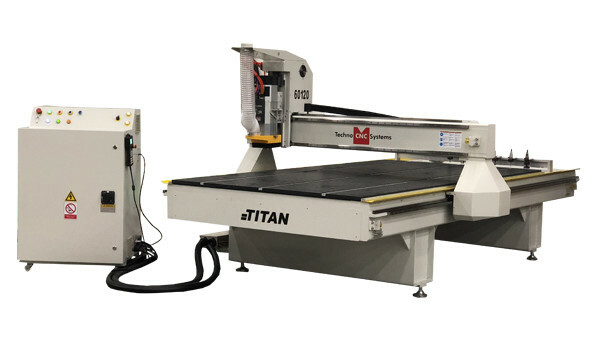 The Titan series includes a 12 HP HSD high frequency automatic tool changer, with 8-postion tool rack, pneumatically operated vacuum hood that has concentrated air flow at the spindle, vacuum t-slot table controlled by a central gate valve, 10HP rotary vane vacuum pump, and pop-up pins for easy sheet alignment. 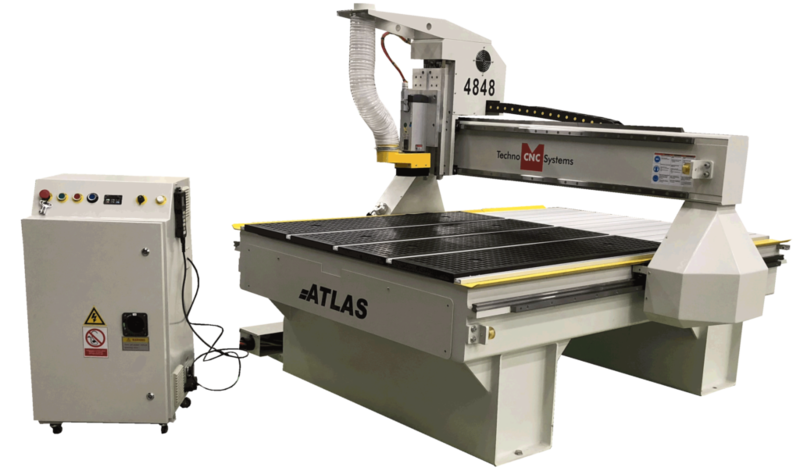 The Atlas Series CNC Router is manufactured using the highest quality industrial grade CNC router components with all steel construction with a 7-1/2” gantry clearance and 11-1/2” z-axis stroke, so the clearance can be properly utilized. Key features include THK linear guide rails and bearings, precision helical rack and pinion with precision gear motors directly coupled to the helical pinion. The Atlas series includes a 4 HP HSD collet spindle, vacuum hood with concentrated air flow at the tool, and a vacuum t-slot table controlled by a central gate valve. 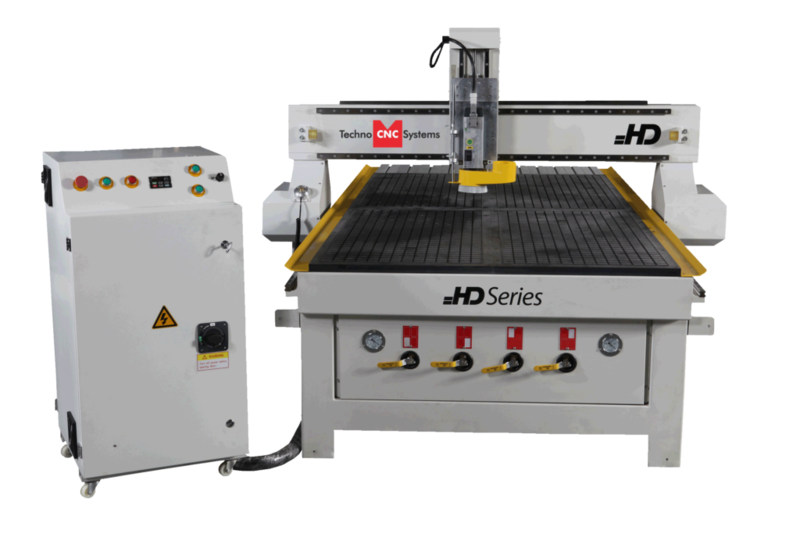 Techno is proud to introduce the NEW HD II 2136 tabletop CNC Router, a compact version of a full-scale CNC system that can be implemented in a production environment or educational setting. 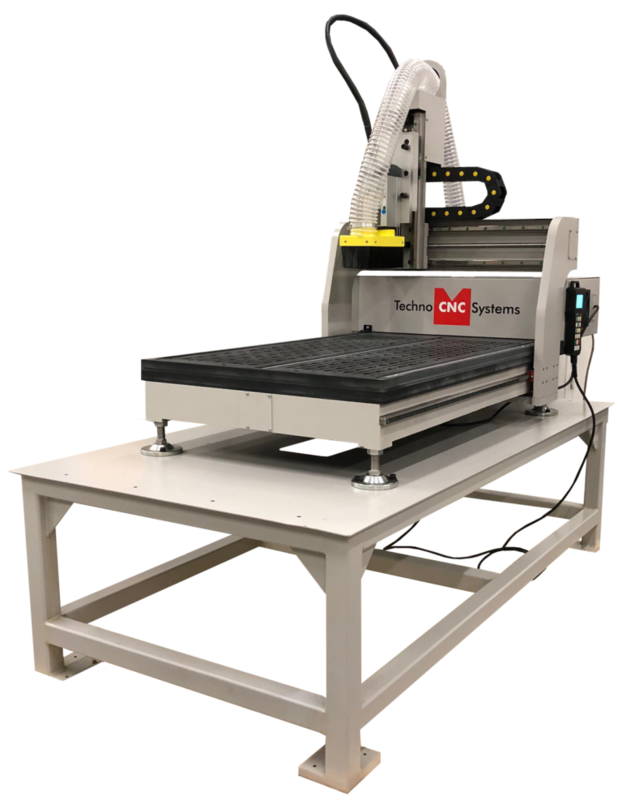 Techno CNC’s new HD II 2136 Tabletop CNC Router features a 20.5″ x 36″ process area, with a 7-1/2″ gantry clearance and a 9-1/2″ Z-axis stroke – comes standard with a 2HP HSD high frequency collet spindle, and vacuum t-slot table. Additional options include a steel base and full safety enclosure with door interlock ideal for educational institutes, a 4th axis rotary table, and tool kits. Additional features include Ball screws on all 3 axes, brushless stepper motors (servo optional), Heavy duty phenolic vacuum table with aluminum t-slot channels, and Techno’s hand-held controller which is the heart of the operational system. This hand-held controller redefines the phrase “easy-to-use”. 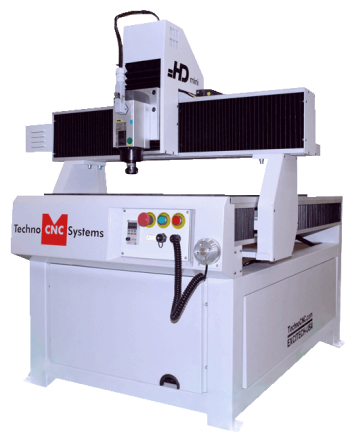 Techno is proud to introduce the HD-II 2136 CNC Plasma, a compact version of a full-scale CNC plasma system that can be implemented in a production environment or educational setting. 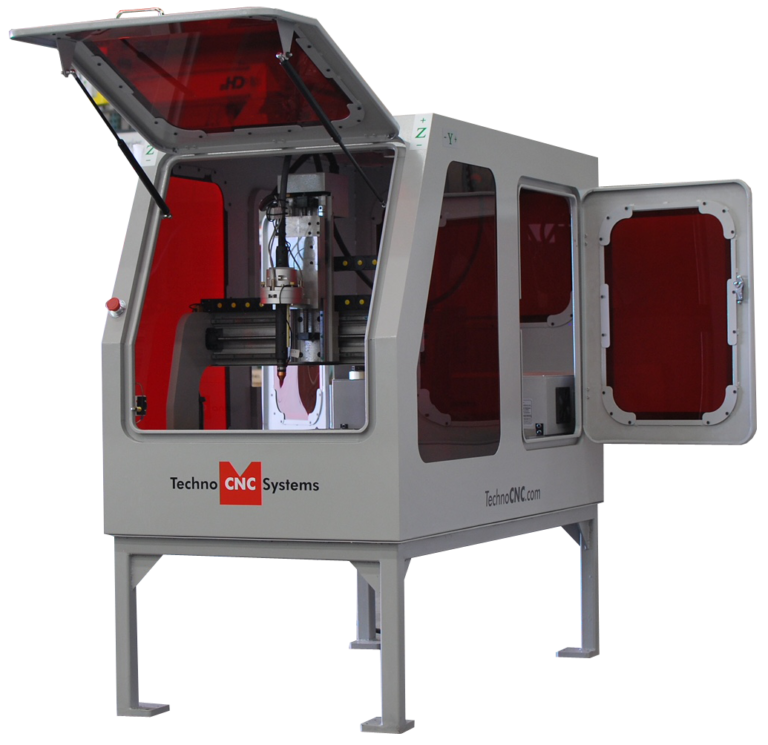 The machine is available with an optional safety enclosure and stand. It can be easily transported around the facility to any convenient location. The HD Mini is a heavy duty CNC router that is an affordable CNC work platform. 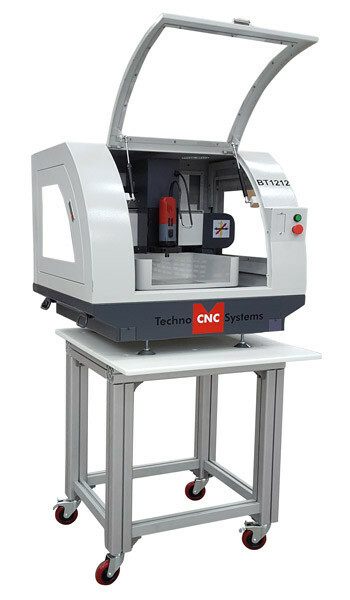 Ideal for any size shop requiring a compact machine to run small routing jobs or to be used as an educational tool, these CNC router applications can include musical instruments, sign works, artistic carvings, and drilling, using wood, plastic, fiberglass, metal or other routable materials being able to fit on the 2′ x 3′ cutting table size. The HD Mini features ball screw drives on all three axes and is controlled using a Techno easy-to-use hand-held micro stepper controller. The controller can run industry standard G and M codes or dxf file formats. The moving gantry provides a stationary work surface and save valuable floor space. 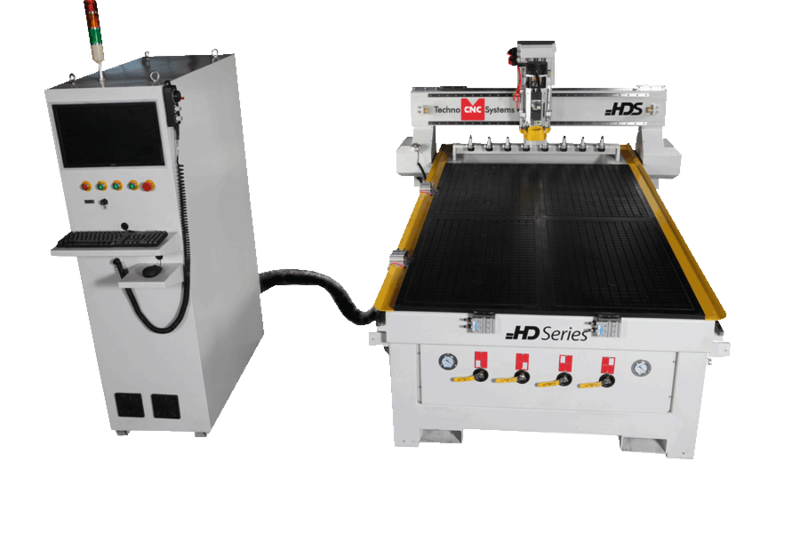 The HD Series CNC Router is manufactured using the highest quality industrial grade CNC router components with all steel construction with a 7-1/2” gantry clearence and z-axis stroke. Key features include THK linear guide rails and bearings, precision helical rack and pinion with precision gear motors directly coupled to the helical pinion. The HD series includes a 4 HP HSD collet spindle, vacuum hood with concentrated air flow at the tool, and a vacuum t-slot table controlled by a central gate valve. 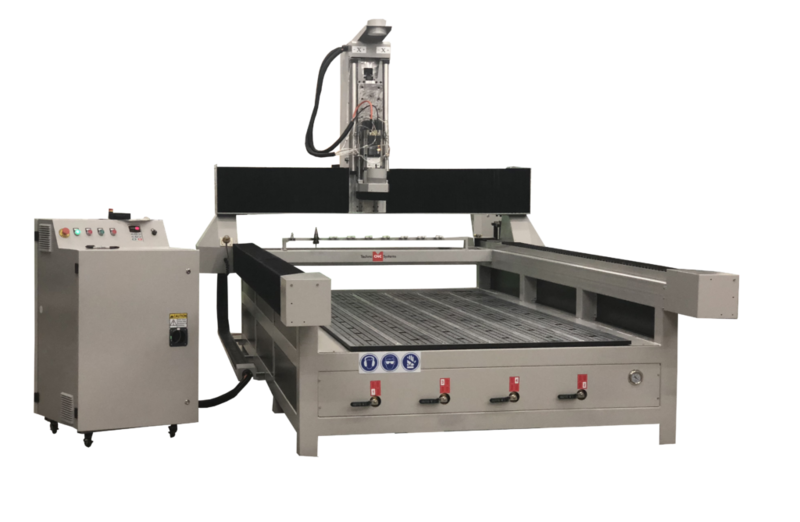 Techno CNC Systems new Venture Plus is an affordable price high powered, versatile and rugged CNC router designed for demanding applications that require high throughput. 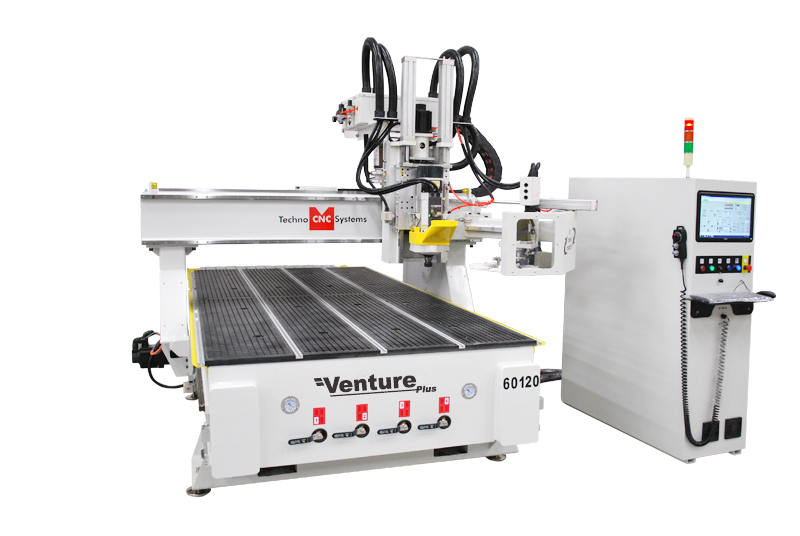 No matter what your production need, the Venture Plus is an ideal choice in today’s competitive manufacturing environment for the fabrication of a broad range of materials such as wood, plastic or metals. The HD-II CNC Plasma Cutter is manufactured using the industry high quality components, and is all steel construction. Driven by brushless drive motors and Key features include THK linear guide rails and bearings, precision helical rack and pinion with precision gear motors directly coupled to the helical pinion.